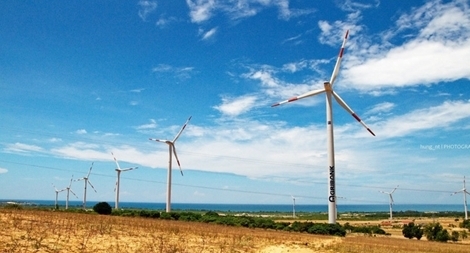 The central coastal province of Ninh Thuan is speeding up the implementation of wind power projects to soon connect them to the national grid and generate electricity as an effort to turn the locality into a renewable energy hub of Vietnam. PSNews – Senior Colonel Thung Van Nhiem, Vice Director of the Department of Homeland Security, on October 31 received a delegation of reputable persons of ethnic minorities from Ninh Thuan province. A seminar took place in the central province of Ninh Thuan on April 11 to share experience in educating disabled children. The construction of a solar power plant with a capacity of 50 MW kicked off in Phuoc Dinh commune of Thuan Nam district, the south central province of Ninh Thuan, on March 31. Construction started on a centre for research and transfer of green growth technology in Bac Ai district, the south central coastal province of Ninh Thuan, on March 17. PSNews - The Standing Office of the Steering Committee for climate change response, disaster prevention and rescue under the MPS sent Official Dispatch No.17 - on October 31st afternoon to police units, requiring all public security forces to proactively respond to flood and rain. PSNews- Police of Phan Rang – Thap Cham city with their humanity and affection organize a charity activity called “Meals of compassion”, providing free meals for poor patients every Friday.